If it has been a while since you’ve seen a dentist, or if you’re shopping around for a new dental care provider, you might be a little nervous about your next appointment. Well, we assure you that there is nothing to be afraid of. If you choose Dr. Bradley Mitchell as your dentist in OKC, you can expect the highest quality of care along with truly personal service. You might even start to look forward to your biannual checkups! Here is an overview of what you can expect the first time you come to see us. Everyone in our office loves to meet new people and get to know them. When you arrive for your appointment, we’ll start things off with a friendly greeting. We might also have to go over a little paperwork. Our new patient forms will help us learn about your medical history, any concerns you have about your oral health, anything you would like to accomplish with your smile, and your insurance coverage. You can also download our new patient forms on our website if you want to get a head start on the paperwork. We often like to take a set of X-rays for new patients, which will help Dr. Mitchell get the most comprehensive view possible of your oral health. We always use the latest in dental technology, including digital X-rays, so this process should be quick and easy. One of our talented hygienists will then clean your teeth, removing plaque and tartar and giving you some personalized tips on how you can improve your oral hygiene routine at home. Or, if it’s obvious that you already have great habits, we’ll give you some major kudos. We’ll also take a look at your periodontal health and then perform an oral cancer screening. 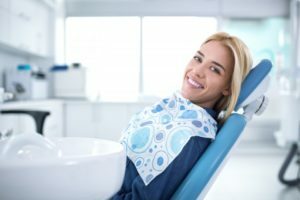 Have you ever been to a dentist and spent a long time with the hygienist and about two seconds (seemingly) with the dentist? That can be frustrating, especially if you have specific concerns or questions about your oral health that you want to talk about. Dr. Mitchell cares about each of his patients on a personal level, so he’ll be sure to take as much time as necessary with you to discuss what’s on your mind. He may suggest a course of treatment to address any oral health issues that were uncovered during the exam. He offers all of the basic services, including fillings, crowns, bridges, etc., but he goes even further. If you would like to give your smile a makeover or even get those pearly whites straightened out, Dr. Mitchell will be pleased to help you with those goals. Tired of cookie-cutter dentistry? Come visit us for an experience that might just change the way you think about oral healthcare! Dr. Mitchell truly enjoys his job and would be more than happy to share his enthusiasm for dentistry with you. If you’d like to ask questions about Dr. Mitchell or his services, please contact our office at 405-755-2670.